We would like to introduce you to the newly re-established Chapter Program. The idea behind the Chapter system is to create a means to grow the Society and provide more benefits and interactions between our Members. You will need just five people to start a Chapter. One must be a Full Member of the USISTD. The rest may be Adjunct Members. You will need to create bylaws and elect a committee to govern the Chapter. Auxiliary Members may be added after the Chapter is formed. Anyone, Professional or Amateur, who has passed any USISTD Medal Test at any level, can apply to be an Adjunct Member. Adjunct Members will have voting privileges and can hold office at the Chapter level, but not at the National level. 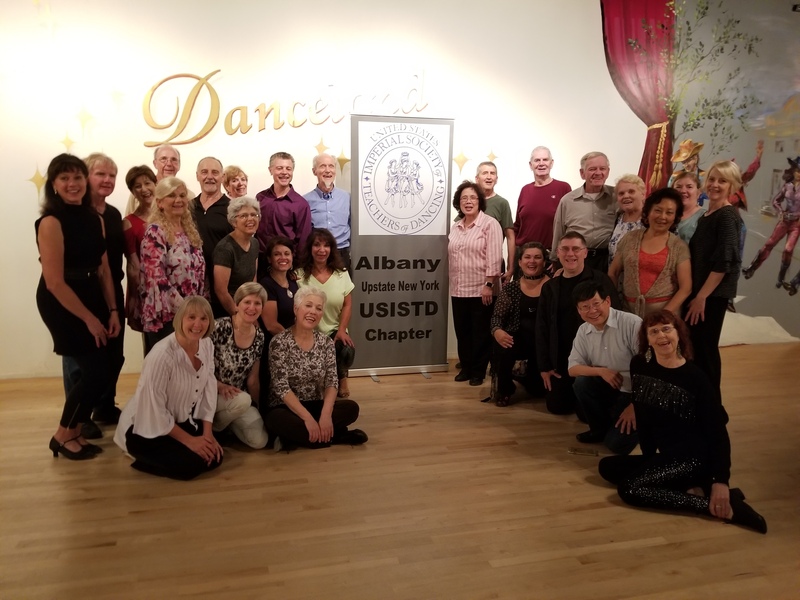 Anyone, Professional or Amateur, who is a dance enthusiast or hobby dancer and wants to have an association to the USISTD, can apply to be an Auxiliary Member. Auxiliary Members do not have voting privileges, nor can they hold office at any level. The USISTD is looking to increase our numbers, while emphasizing our identity as the premier dance educators in the World. The Chapter Program will make it possible to give training opportunities more often and in more diverse locations. The National Committee has pledged to assist its Chapters in this endeavor by providing USISTD Members, within driving distance of the Chapter, to give training opportunities periodically. Here in the Chapter Section, you will find all the information and applications regarding Chapters. Later, as Chapters are formed, there will be other content relating to Chapter News and Events. We are looking forward to the formation of Chapters everywhere there are USISTD Members. For more information or assistance please contact the President of the USISTD. Chapter Committees shall be comprised of three (3) members elected from among the Chapter membership. Candidates for election to Chapter Committees be current and in good standing with respect to their dues. Chapter Committee terms shall be for one (1) year and elections for the new term shall be held during the late Fall of the year. Chapter terms will be from January 1- Dec 31 annually. Once elected, the Chapter Committee shall select its own officers by vote at their first meeting. Officers shall consist of Chairman, Secretary, and Treasurer, one of whom shall be a full Member of the Society. The officers shall provide the National Committee with minutes of all Chapter meetings and with quarterly financial statements. (a) Chapter members may include USISTD Members, Adjunct Members, and Auxiliary Members. An Adjunct Member must have successfully passed the USISTD Medal Test in any dance at any level offered by the USISTD. Adjunct Members will receive Topline Magazine and have voting privileges at the Chapter level. Adjunct Members are not Full Members of the USISTD, do not have voting privileges at the National level, and may not advertise or imply teaching or judging credentials with the USISTD. An Auxiliary Member is a dance enthusiast or hobby dancer with a desire to have an association with the USISTD, either independently or through a Chapter, and will receive Topline Magazine. Auxiliary Members are not a Full Member of the USISTD, they do not have voting privileges at any level and may not advertise or imply teaching or judging credentials with the USISTD. Failure to comply with these requirements will result in intervention by the National Committee and, should the National Committee deem such action appropriate, may ultimately lead to the dissolution of the Chapter. In the case of the dissolution of any Chapter, all financial records, funds, checkbooks, bank accounts, electronic bank records, and properties if any, shall be to the National Committee within 45 days.